Ernest with some other members of the Men’s Dress Reform Party, July 1929. 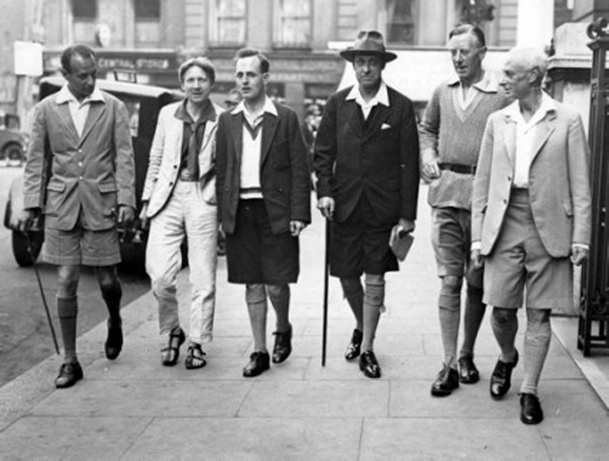 "An ardent campaigner for brighter men's clothes is Mr. Ernest Thesiger, the actor, who so skillfully mimics the late Sir Austen Chamberlain in Bernard Shaw's 'Geneva.’ At the Malvern Festival a few months ago he caused a minor sensation among the inhabitants by wearing orange linen trousers alternately with corduroys, in which several bright, vivid colours had been woven." “SIR,—There is no doubt that a reform in men's clothing is greatly needed—from the point of view of comfort as well as hygiene. Unfortunately the only people who have so far showed their common sense in this direction are at the wrong end of the social scale, and the conventional upper classes are loath to follow a fashion that they have not had the sense to initiate. Moreover, no reform can be made by any society or organization, as most people prefer discomfort to the risk of being thought cranky. I should like to see soft shirts and shorts become the universal summer wear for men, and in winter, something resembling a Russian blouse, with a belt, could be worn over the shirt. For evening wear I should regret the disappearance of the starched collar, which is clean, smart, and not uncomfortable, but some modifications of the present dress suit could no doubt be introduced.